This special bundle includes 1 Pair of Medium Earasers, Metal Carry Case and Information/Instruction Manual. Whether you are a musician, attend concerts or are regularly exposed to music played at high levels, Earasers don't plug up your ears and muffle sound like more conventional earplugs. Manufactured by a 45+ year hearing aid company, and developed by their lead engineer - a musician for over 20 years - Earasers filter out loud noise while still allowing you to hear at a safe, comfortable level. Musicians have to be able to focus on the different layers of instrumentation. 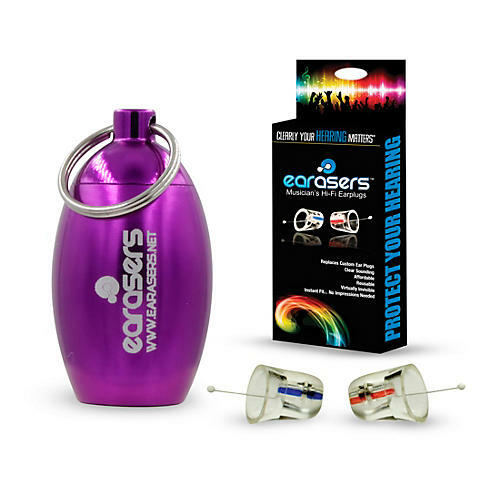 Earasers utilize a unique attenuation "V filter" to provide an overall 5dB EPA rating of protection. The result is the world's first flat frequency response earplugs. Most comfortable with improved sound. The Earasers soft silicone design is based on one of the most widely used hearing aid tips in the market. There is no need for expensive trips to a specialist to get custom ear molds. The Smart Seal technology conforms to the shape of your ear canal for a more comfortable fit that you can wear all day.